Where in the USA do you go during a storm chase? Severe weather and tornadoes do occur all over the world but the severity, the frequency and the accessibility of the storms are unmatched when it comes to the storms of the United States. Although states like Kansas and Oklahoma are the most famous for severe storms and tornadoes, severe weather does not only occur in the Tornado alley in the Midwest but is also quite common in states like Florida and Georgia. Northern Mexico and southern Canada do get a fair share of severe weather as well but to no extent as much as the USA. Even though storms may occur in many parts of North America and the United States, this does not mean that there is organized storm chasing all over this area. Where you go on a storm chase is, of course, highly dependent on where the storms are. Tornadic storms could appear over a great area in North America but where you go to chase them is related to the season and terrain. In April / early May, most of the major storms occur in the Texas and Oklahoma area. Although storms can be formed over the Mexican plains, a tour company will not chase there due to safety reasons, bad road network etc. As it turns to late spring and summer (May / June) the storms are spread widely over the great plains and you are likely to be chasing in northern Texas, Oklahoma, Kansas, Nebraska, Colorado, Iowa and Missouri. In June and July the storms often stretch into South Dakota, North Dakota, Wyoming and even Canada. If you go on a tour during this time of year, make sure you bring your passport (check with your tour operator if they may chase in Canada). The western boundary for storm chasing (and storms) are set by the Rocky Mountains. Severe storms are not likely in the mountains and it would be virtually impossible to chase in that type of terrain. The eastern boundary is not as strict as the western. Severe storms often stretch into Missouri, Wisconsin, Minnesota and Arkansas. The terrain of the eastern part of the Midwest is, however, a limiting factor for how far east you will go on a chase. Get to it in time. Be able to position yourself to see the storm – on a consistent basis. Not have your view obstructed by anything. How populated the area is, the road network and the terrain are all important factors that will determine how successful you will be in observing the storms, how safely you can chase them and consequentially whether your tour guide will chase them or not. In great farm states, like Kansas, you typically have an almost 180 degree view (from horizon to horizon) of the sky, making it possible to see the storms from miles and miles away. These areas are also often filled with small gravel roads, making it quite easy to position yourself for the storm and positioning is a very important factor in terms of safety and how well you will see the storm. In some regions, for example Arkansas, your line of view may be highly limited by hills and trees. With tall trees on each side of the road you may only be able to see storms that is just over your head. A tornado could be reported a mile away but you cannot see it because you can’t find a pocket of unobstructed view! 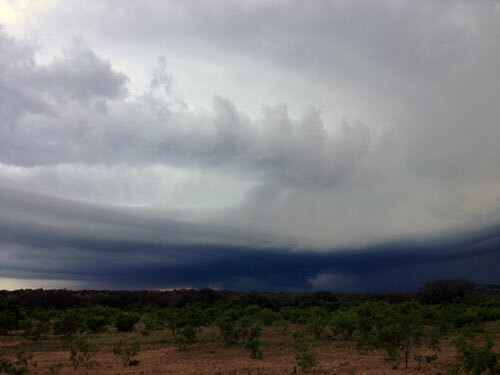 In areas such as south central Texas (where this photo was taken) it could be difficult to see the lowest, most interesting part of the storm, due to the hilly and tree-filled terrain. Populated areas are also something a storm chaser would avoid. Getting stuck in a traffic light or traffic jam during a chase is not only very frustrating but can also be unsafe. These limiting factors could all influence why your tour guide will choose one region, or road, over another even though it seems like you will be driving away from interesting storms. This could be a source of frustration but you need to trust your tour guide to make the best decisions and not get too blinded by the radar images and reports you may see, or hear of. Positioning is everything when it comes to storm chasing. The tour guide needs to keep track of where the storm is going and be sure to stay ahead of the storm in order to stay at a safe distance from hail, lightning and tornadoes. Another important reason to be in front of a storm is that you can typically get a better view of the storm in front of it, rather than behind it. Most often severe storms tend to go in a south east direction, whereas the roads go North-South or East-West. While a storm sweeps diagonally over a county you most likely have to zig-zag around it, basically driving about 50% faster than the storm in order to stay ahead! Not only do you have to drive a longer way around, while doing so you will occasionally end up far away from the storm. If you are unlucky you may miss that moment when the cloud creates a tornado, although you are actually on the storm. For those reasons, some regions are very difficult to chase, even though they get their fair share of tornadoes. Some tours may follow a storm into a difficult area like that but will most likely never target the same area (unless there are no other targets that day). Where are the storms most suitable for photographing? For many, photographing the storms is an important part of a storm chasing adventure. The primary objective is of course to actually have storms to chase and observe but the storms, and your ability to photograph them, could vary. As mentioned, the terrain in some parts of the USA makes it quite difficult to observe, and photograph, the storms. Severe weather over the fields and plains of Oklahoma, Kansas and Nebraska offers very good views of the storms. 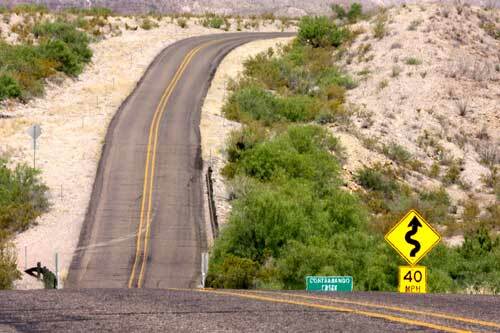 Great road networks also makes positioning easier, which will impact the view of a storm. Colorado storms are sometimes a bit different due to the way many of them are formed next to the Rocky mountains. They tend to be higher based (the base of the cloud is further away from the ground) than other storms. If a high base storm produces a tornado, it is more likely to produce a longer visible part of the tornado. Higher based clouds are, however, less likely to produce tornadoes than lower based storm clouds. In June, the storms in the northern plains tend to be more dry than the ones in the southern plains earlier in the season. This removes a lot of the foggy skies that comes with high humidity and tend to isolate the storms and make them more distinct, which allows for great photographs. It typically makes them higher based as well. Finally, please note that this is all just probabilistic type of information and is by no means any type of fact. If you want to dig deeper into where storms and tornadoes tend to appear, read this interesting report from NOAA.